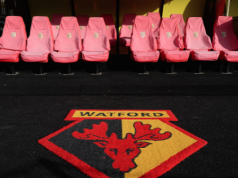 Wolverhampton Wanderers have been a frequent subject in the Portuguese press for the entire season, so we could expect big coverage about the club’s promotion to the Premier League this weekend. Nuno Espírito Santo and the Portuguese players all had their glory stamped on the papers yesterday and today. First in the Sunday issue for the mathematic promotion, and now for the celebrations with the 2-0 win over Birmingham City. 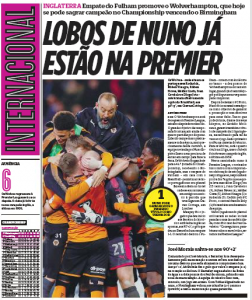 On Sunday, O Jogo came up with an entire page having a headline saying ‘Nuno’s Wolves are already in the Premier’, while Record said ‘Nuno brings Wolves back to the Premier’. 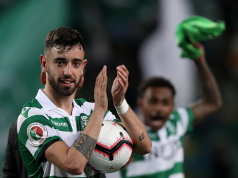 Although Wolves had plenty of Portuguese players in the spotlight this season, including three of their four top scorers, it’s clearly the manager who is getting more attention in the country. On Monday, the stories continue, especially with mentions of the party the players had at Molineux Stadium. With its headline saying ‘Wolves makes the party with beer’, newspaper A Bola opens it’s article using a traditional Portuguese expression, which goes ‘it’s a Portuguese party for sure…”. Newspaper Record used the picture of the players with a Portuguese flag, and covered all the social media posts from the Portuguese players in the squad. But it’s not only a Portuguese manager and players had a part in Wolves’ campaign. A Bola writes Jorge Mendes was acclaimed by the fans during the party, as he was responsible for several transfers, plus for helping the Chinese takeover. The outlet claims Wolves will now be among one of the 30 richest clubs in the world with all the Premier League money that is about to come, with an income of around €220m between prizes and TV rights. Portugal seem very proud of what Nuno and his boys achieved, and certainly can’t wait to see them in the Premier League next season. 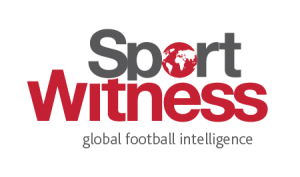 And whilst we’re on the theme, a big congratulations to Wolves and the club’s supporters from everyone at Sport Witness. We’ve certainly enjoyed covering the club over the past season.